One of the biggest bus operators in Malaysia is Perdana Express (Tiara Persona Sdn Bhd), which is based in Kota Bharu in Kelantan. 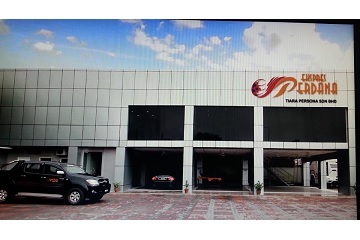 Established in 2009, this company was previously known as Tiara Pesona They provide bus services for numerous routes within the east coast of Peninsular Malaysia, especially in Kelantan and Terengganu with affordable prices. Travellers can conveniently purchase Perdana Express bus ticket here on Easybook by following these few simple steps on how to book that can be completed within a few minutes. 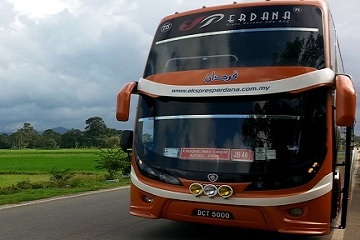 Perdana Express is known to offer great services and be on time in order for their customers to experience a pleasant journey to the destination. For those who have made online booking for Perdana Express bus tickets will get to ride with a double decker bus that fits from 26 to 43 comfortable seats with 2+1 arrangement. Perdana bus also offers TV on board to keep passengers occupied as they stretch out their legs on the spacious seats especially during long-haul trips. On top of Perdana Express’ most popular route with numerous trips daily from Kota Bharu, the capital state of Kelantan to Kuala Lumpur, there are also so many other trips under the company’s schedule. 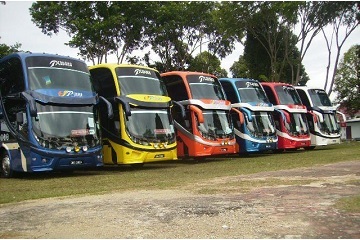 Perdana bus company’s slogan read “Selamat dan Selesa” which translates as Safe and Comfortable. That is exactly what Perdana Express offer to their customers when they would replace old buses that are over 5 years with Scania buses from Europe to allow better services with each trip. Add that with professional drivers, this bus operator has become a household name among locals and tourists from all over the world for being reliable. Get the online booking for Perdana Express bus tickets that are available conveniently on Easybook today. As the largest land and sea transportation booking site across Southeast Asia, the bus tickets can be purchased within minutes by following this simple booking guide that has been prepared for our users. Select the travel time and choose the preferred bus seat upon searching for the schedule, make the payment securely on Easybook and receive the order summary via email within a few hours. To make the experience even more convenient, travellers can also purchase the bus ticket via Easybook’s mobile app that are available on both Google Play Store and Apple App Store. Get your bus ticket today at Easybook and travel within Peninsular Malaysia with Perdana Express buses safely. Make sure to check the trip properly before booking. We look forward to serving your next trip with Perdana Ekspres!